Ladies and gentlemen, my utmost apologies, for this is a very late entry for May’s Food & Wine Cover Recipe Challenge! Lots of things have been going on in my world lately that have kept me away from the blogosphere. First things first: We moved! Adam and I are literally moving up in the world from the basement of a 1970s student cave to seventh heaven in a brand new building in the North End. We are very excited about our brand spanking new home, and I am even more excited about my very new and very white kitchen, with a double sink and fancy pot drawers! Needless to say, it took a few days in the new place to get everything organized enough in the kitchen to get cooking! 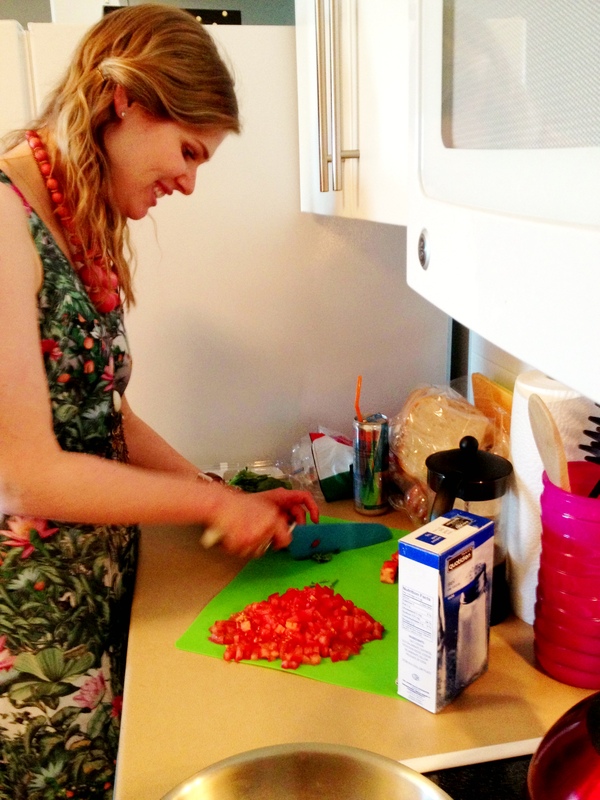 But the minute we were settled, Erin and Matt joined us last Wednesday evening for May’s Cover Recipe Challenge, and it was one for the books. 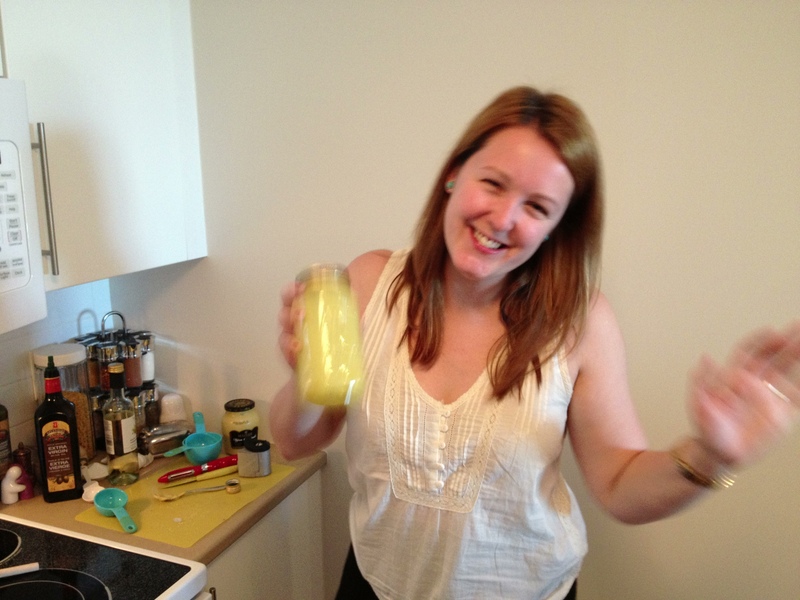 Happy as a clam making dressing in my new kitchen!! 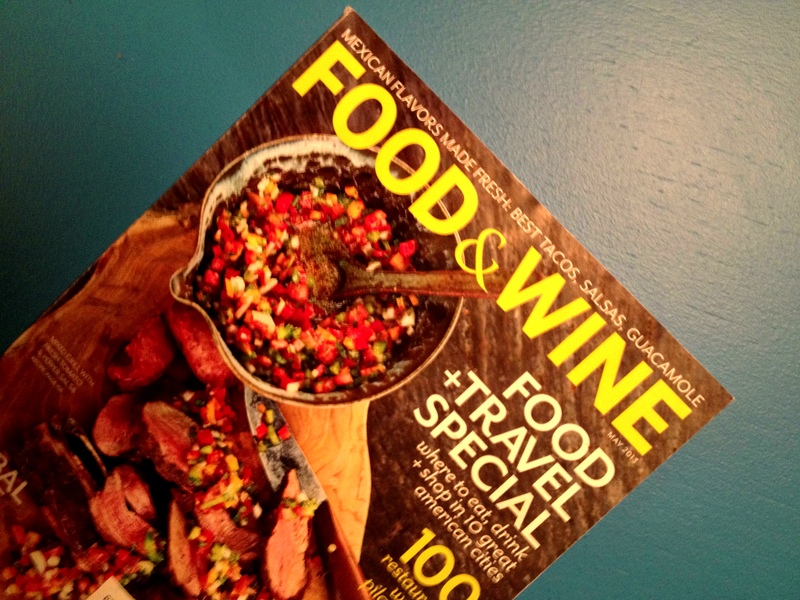 When Adam saw the cover of May’s Food & Wine magazine, he practically skipped back to the apartment from the mailbox. 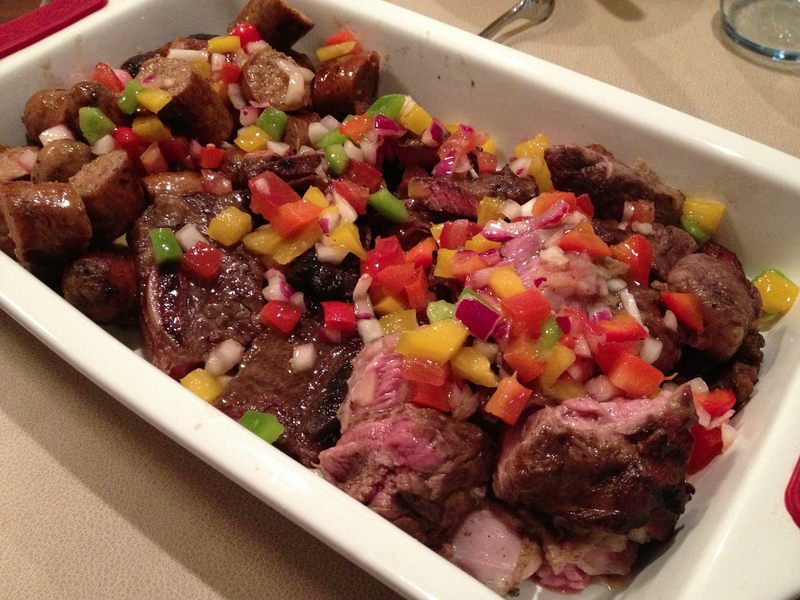 This month’s recipe was a full plate of various meats done on the BBQ with a delicious looking chunky salsa. Simple, easy, and tasty right? Well yes, it was, but honestly, it was nothing to write home about. The preparation of the recipe was very simple. The first aspect of the dish was to prepare the Tomato-and-Pepper Salsa the day before in order to let it get extra juicy and tasty. It was really easy to make, consisting of peppers, tomato, red onion, garlic, and EVOO. The day of, I prepared the chorizo sausage, lamb roast, and beef short ribs to be grilled and left Adam in charge of our newly acquired BBQ. Our lovely friend Samantha moved home to Newfoundland this past week and was generous enough to give us hers! He did a great job cooking those choice cuts! The recipe was clear and easy to follow, although I cannot lie, I do not understand how a spherical mound of potato is supposed to be evenly browned on all sides. Once the potatoes were rolled and dipped in the egg and the breadcrumbs, I had one hell of a time keeping them from rolling to one side in the sizzling oil! But, in the end they turned out pretty good, despite their lack of uniform brownness. The most amazing and wonderful part of the meal came before all of these delicious things. The oysters. Oh man, let me tell you about the oysters. While perusing F&W for an appetizer (like I do every month) I came across the recipe for Grilled Oysters with Chorizo Butter and I was intrigued. 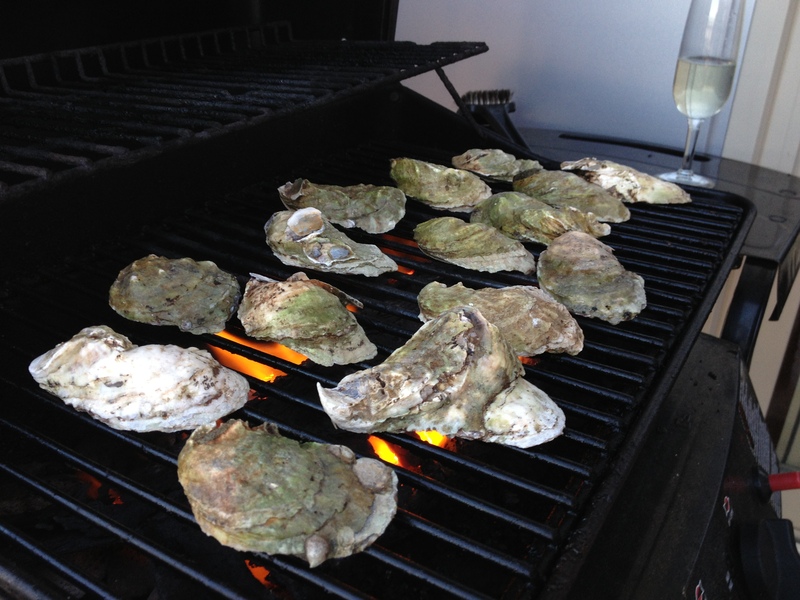 I had never ever thought about cooking oysters, let alone barbecuing them! But they sounded delicious and easy, so I decided to be adventurous and go for it. Truth be told, I have never prepared oysters at home, and though I love them at restaurants, I couldn’t help but be a little shy about preparing them at home, for guests, on the BBQ. But in the end I am oh so happy I did. The first step to the recipe was to make the Chorizo butter, which basically consisted of removing the casings of a few chorizos, frying them up in a pan and then melting in A LOT of butter and lime juice. Easy. 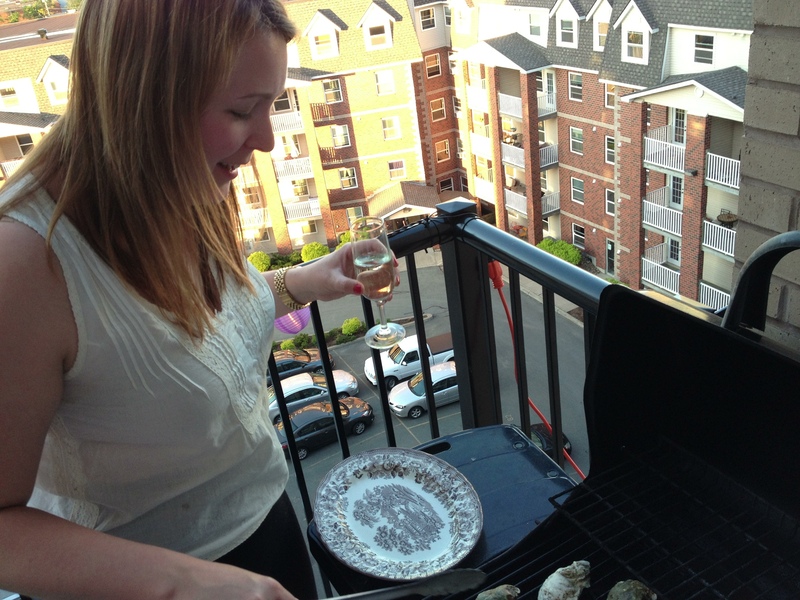 Grilling the oysters required a little more time and attention. It was all very exciting, and all four of us gathered around the BBQ, prosecco in hand, to watch the process. All you had to do was make sure the oysters were laid flat side down on a very hot grill and wait for them to pop open. Well, you never saw four people get so excited for a shellfish to open! It was great fun watching them open, ever so slightly, one by one. And then it was time to eat. Right when everyone was sitting down to the table, I drizzled (more like smothered) the oysters in the chorizo butter sauce. 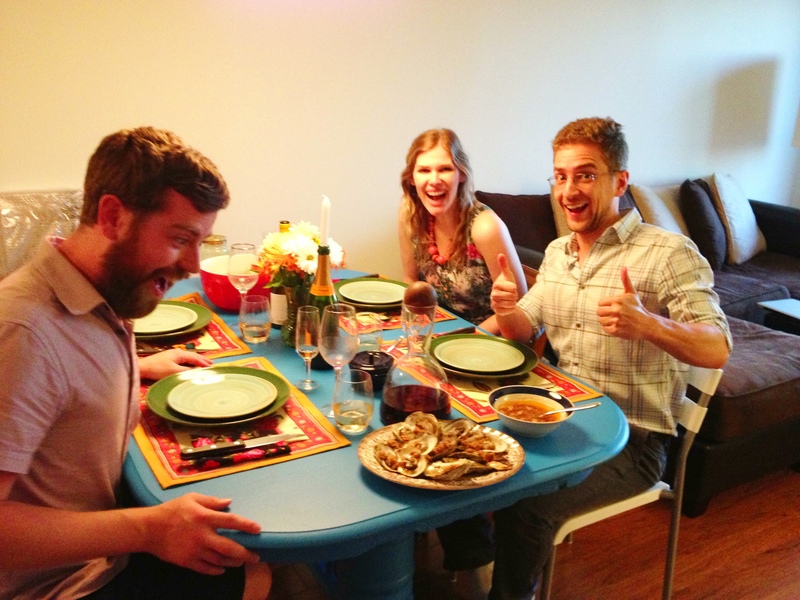 By the time I got to the table, it was clear that everyone was very hungry and excited to eat some oysters! THEY WERE SO GOOD. Like crazy good. I could not believe how good the Chorizo tasted with the oysters. It was heavenly and I am not kidding you when I say it was one of the best things I have ever eaten. 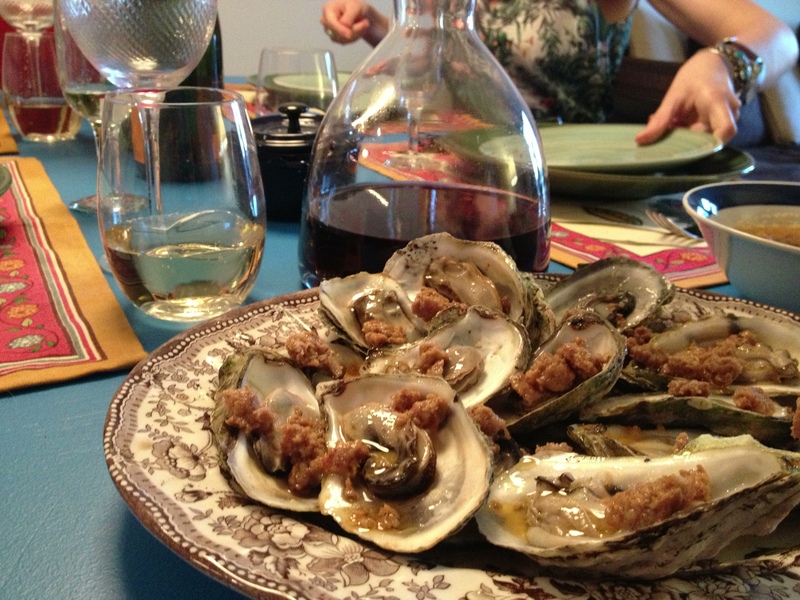 They were so easy to make, you literally have to melt butter with sausage, and you don’t even have to shuck the oysters. Everyone at the table was loving life. The main was also delicious. 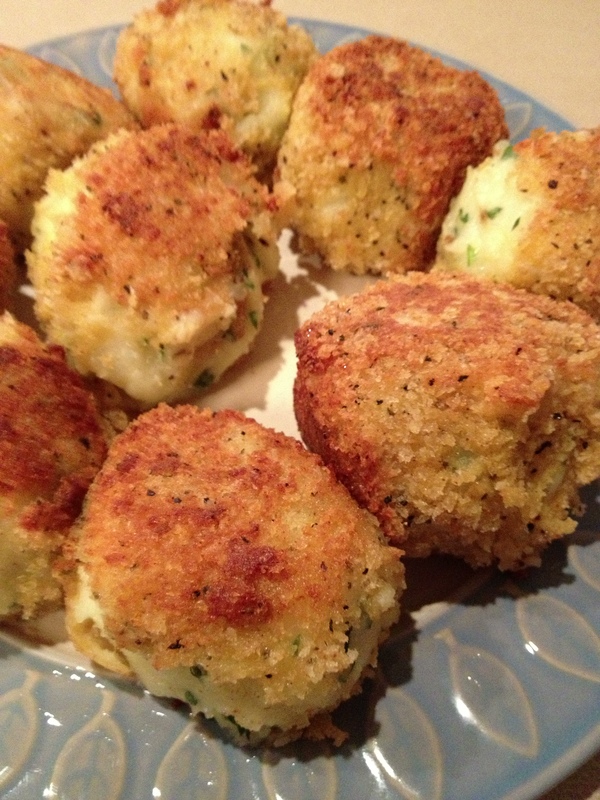 The croquettes were ooey gooey on the inside and crispy on the outside, and the meat turned out awesome! 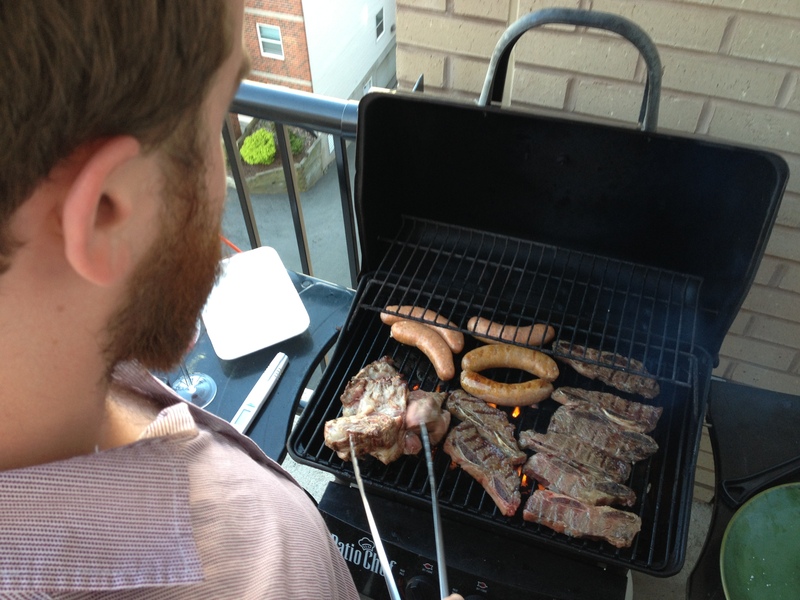 Adam did a great job cooking the meat; the lamb was cooked to a perfect medium rare and was tender and juicy. The salsa added a lot of flavour to the meat, but honestly, it wasn’t the best mixed grill I have ever had. THE WINE: For the evening, we had three different bottles of wine. To start we had an excellent Chablis that Erin and Matt brought that went perfectly with the oysters. 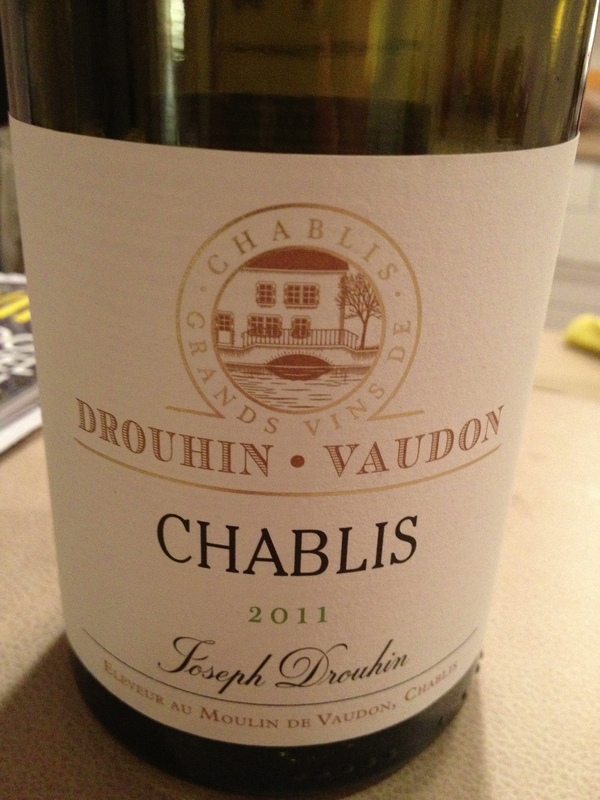 The Drouhin-Vaudon Chablis 2011 was crisp and light, and complimented the rich and buttery oysters very well. For the Mixed Grill, it was suggested that we pair the dish with a Chilean red, the Cono Sur Vision Cabernet. 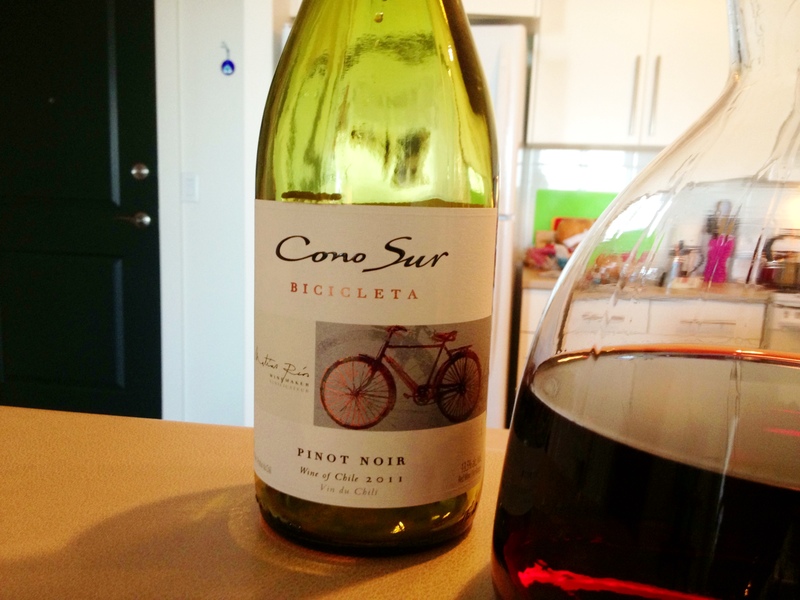 However, this is not available at the NSLC so I chose the Cono Sur Pinot Noir 2011, because I knew it would pair well with meat. 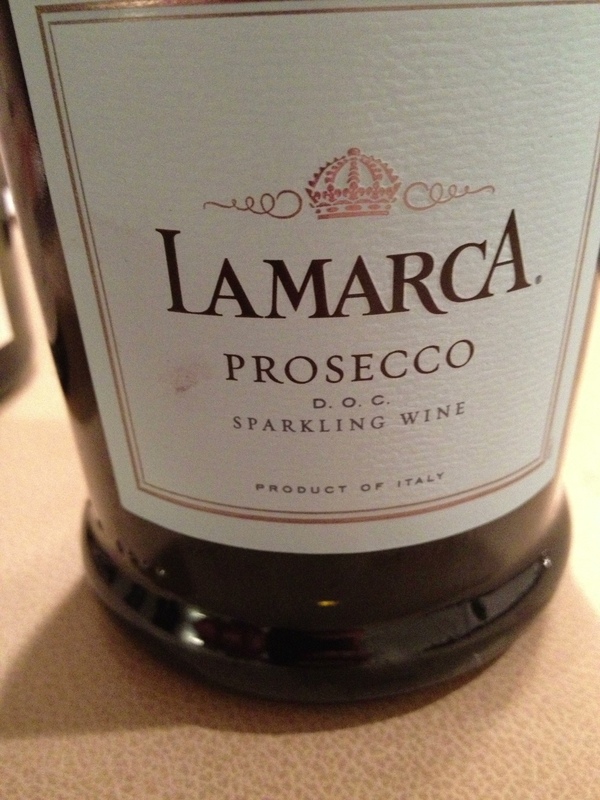 It was a great choice in the end and its fresh and fruity finish paired well with the meat and the salsa. 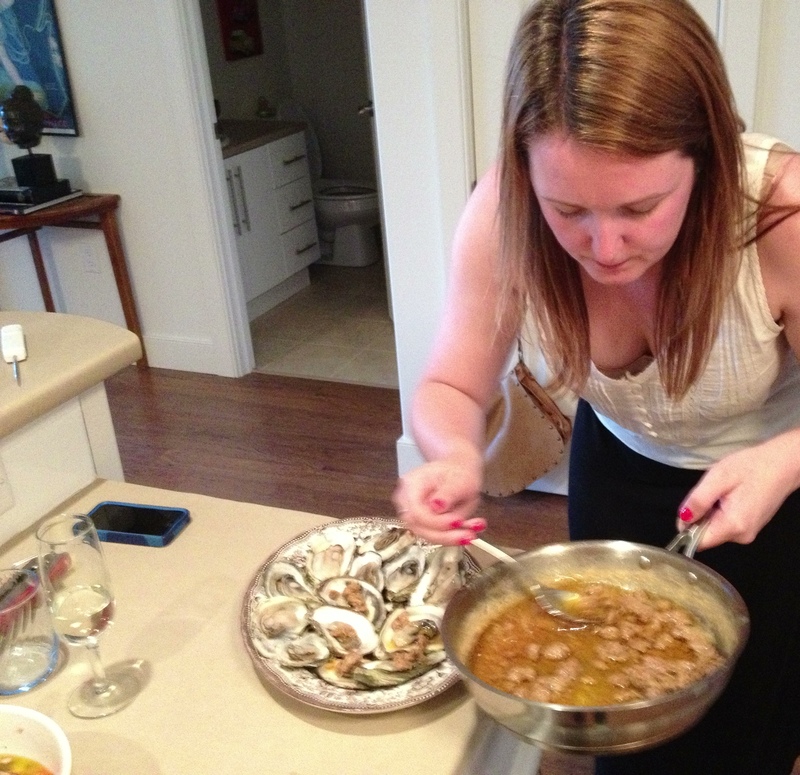 Overall, I consider May’s Cover Recipe Challenge another success, but mainly because of the delicious oysters. The cover recipe was good, not great, but it has definitely inspired me to try more roasts on the grill. I will say that I have gotten over my fear of oysters in my home kitchen, and I will definitely be willing to Explore.Eat.Repeat all types of oyster recipes in the very near future. Barbecued oysters definitely do not shuck.